Right now, we’ll pay TOP DOLLAR for your vehicle! and are willing to offer you TOP DOLLAR for it. 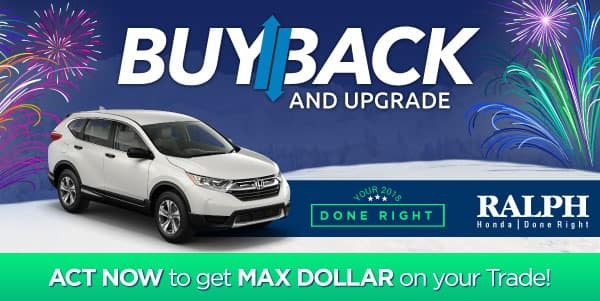 Plus right now, you can take advantage of our 2018 Done Right deals! *Valid at Ralph Honda. Excludes Fit models. Not valid on prior purchase. Not redeemable for cash. Offer ends 1/31/2018. See dealer for details. **2017 CR-V LX AWD – MSRP: $26,245 – RW6H3HEW. 36 month closed end lease. $3499 trade or cash down. First payment, $595 acquisition fee, taxes and DMV fees due at signing.12,000 miles/year. $0.15 overage. To qualified buyers through AHFC. 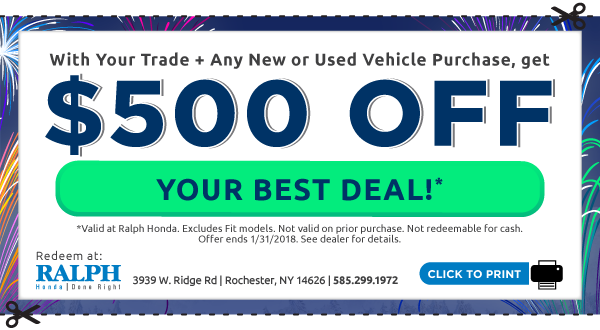 Offer valid through 1/31/2018.